The eighth week of this year’s HPR Cocktail Showdown was another tripleheader for our panel of judges. On this particular week, we found ourselves focused on a trio of downtown dining and entertainment establishments to visit some new competitors as well as experience the return of a couple of seasoned veterans. We first made a return to the Sanctuary Events Center to visit Aaron Duma and spend some time in the coolest “church basement” in town while drinking a couple of entries and hearing about some future plans for the former Usher’s location in Moorhead. Before we get to the drink entries, a little about the Sanctuary Events Center and the upcoming acquisition by Aaron Duma and his partners, a space that is now becoming known as River Haven. As we settled into the lower level of the Sanctuary, Aaron told us a bit about his plans for transforming the space that used to house Usher’s and before that, The Broken Axe. His respect for the space, the river, and the history of both will be evident and prominently on display after the main level is completely opened up and will then offer a nearly unobstructed view of the river from the moment you enter the front doors. His excitement about the new space is contagious and I encourage you to keep an eye open for the first opportunity you will get to check out how he puts his own touch on a space that is special not only to him but to many other Moorhead residents. As he told us of his plans for the new space, the current space was humming along with activity in preparation for an upcoming private event. The Sanctuary Events Center has a history dating back to 1886 but has most recently become known as one of the premier full-service wedding and hospitality venues in the local area. With a top-notch catering service, Chef’s Table Catering and a professional photography service all operating out of the same space, the possibilities for them providing you with a truly unique and full-service private event experience are unparalleled in our area. On the night that we visited Duma in a space that I’ve often enjoyed whiskey or wine samples in at various fundraiser and beverage industry events, his staff was busy folding tablecloths and other linen for an upcoming private event. Aaron served us up a surprisingly sophisticated take on a homemade sangria that featured a homemade kombucha green tea. The kombucha tea was fermented for a week and infused with a triple berry mix of blackberry, raspberry, and strawberry. A serving carafe with a batched blend of spiced rum, cognac, lemon rum, peach liqueur, Malbec wine, and a juice blend of cranberry, orange, pineapple and a bit of lime juice was used to dispense a bit of the booze and juice into a wine glass with ice. This pour was then topped with a bit of the fizzy kombucha tea and a touch of Fargo Brewing Company’s Kenny’s Lemonade radler. 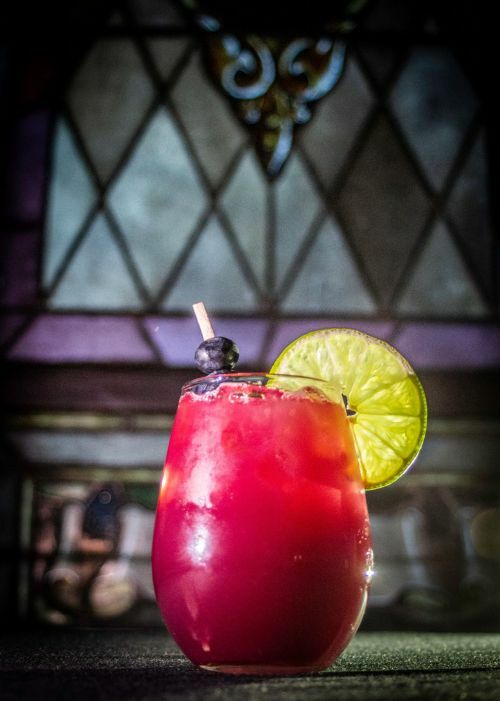 The glass was garnished with a lime wheel and a bamboo stick with a strawberry and a pair of blueberries.The drink was quite fruity and bursting with juicy flavor and the bite from the kombucha was nicely balanced by the sweetness of all the fresh fruit juice. Sangrias are usually too heavy on the acidic citrus for me to easily enjoy a whole glass of but this one was quite well balanced and the way it was batched for ease of service made it seem quite viable for an entry from a venue known for weddings and concerts and not craft cocktails. As someone who grew up on pro wrestling in the mid-80s, I immediately grinned from ear to ear when Aaron told me the name of his after-dinner drink entry into this year’s competition. The name is more of a nod to the base of this cocktail creation rather than the flamboyant and colorful wrestler it was named for but the chocolate love is strong throughout and illustrated by the use of a real homemade cocoa recipe full of chocolate and cream. To this, Aaron added ¾ oz of Jameson Irish Whiskey and Five Farms Irish Cream, a true Irish cream that is so authentic it even comes packaged in an old blue tint glass milk bottle with a swing cap top. 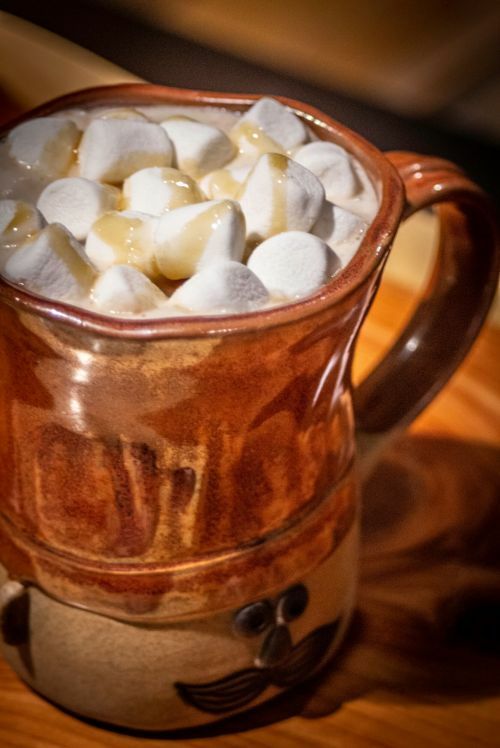 On top of this, he added a layer of homemade Irish Cream infused whipped cream, a layer of mini marshmallows, a topping of drizzled caramel, and to finish it all off a pinch or two of salt. The high-quality Irish Cream blended quite well with the Jameson and the touch of salt had me licking my lips again and again and rolling in the salty caramel pleasure that came with each taste of the whiskey infused cream coated cocoa. The consistency of the whipped cream was worth every bit of extremely vigorous shaking that Aaron had to give that hand “whipped” cream and if the judge's thanks aren’t enough, I’m sure his pythons will be showing the results of the extra effort, “brother”. Less than a block away from the Sanctuary Events Center is one of the focal points of the local fine dining scene, Mezzaluna. 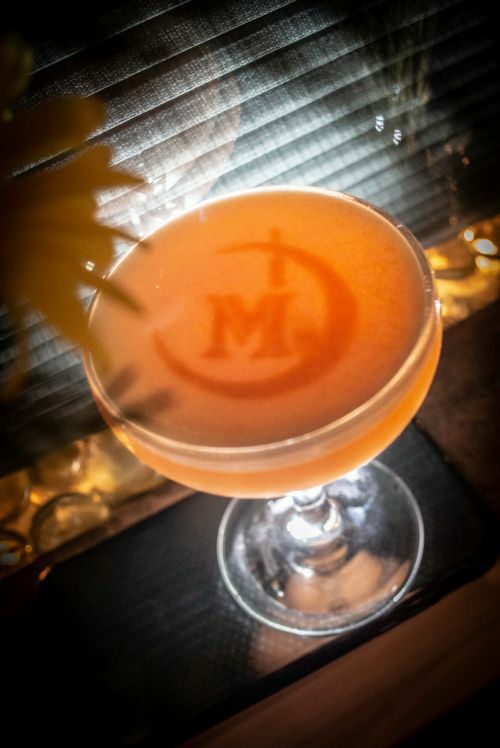 Since 2012, Mezzaluna has been known as that cleverly hidden alleyway eatery, that chic hotspot for Grey Goose on tap and cool clamshell booths, a space with a super eclectic ambiance, Fargo’s finest fine dining, and more. This space seems to mean different things to different people but it has almost always been known for being all about service. Perhaps that is how and why someone like Taylor Snelling could make such an ascension from humble beginnings behind the bar where he learned attention to detail and specifically a reputation for impeccable service to General Manager until finally landing in his current role as the restaurant owner. It’s the kind of place where attention to detail and service is woven into its history and very existence. Tori began by adding a special bottle of Blanton’s bourbon into a pitcher with ice, yellow chartreuse, and rosewater. She explained that this drink had a specific Kentucky Derby theme that would be on display throughout the entirety of the drink, including the fact that the Blanton’s was aged with a bit of barrel remnants from a bourbon barrel that not only formerly held 1792 bourbon but also was used to age some of the most recent batches of Junkyard’s Pegasus Stout. The pitcher was stirred with ice and then strained into a rocks glass with a large cube and then garnished with a dried rose petal to tie into the rosewater and give a little nod to the rose wreaths bestowed upon the derby champions. The little bit of time spent with the barrel oak added a remarkable amount of oak and roast to a bourbon that I normally wouldn’t choose for a cocktail. While most wouldn’t choose Blanton’s because of its price point and availability, to me, it is a spirit that is renowned for its incredible smoothness and consistency but not necessarily its character or intriguing flavor. The way its subdued flavors allowed the floral characteristics of the chartreuse and rosewater to still peek through the caramel, vanilla, oak, and roast was delightful and surprising. Created as a response to the water crisis in Florida, Tori set out to draw attention to the fact that Lake O(Okeechobee) in Florida is crippled by algae bloom resulting from the leaching of anhydrous ammonia from sugar cane farming. She began with Bluecoat Gin that she infused with lemon and added to it fresh squeezed orange juice, Aperol and house-made orgeat syrup. This was dry shaken with an egg white then strained into a coupe glass and garnished with a Mezzaluna logo stencil that was a spray of Amaro Lucano, a bitter liqueur. The most invisible part of this drink was the lemon infusion of the gin and Tori even had to grab an uninfused bottle and hold them both up to a light to show us the tinge of green peeking thru the otherwise blue bottle. The first sip brought that invisible infusion front and center with a perfect kick of lemon that was pulled into the botanicals and bitters of the Aperol and gin and as I lowered the drink, I got a nice wafting aroma of the Amaro Lucero blended with the aroma of the fresh orange juice that was lifted up through the egg white foam. 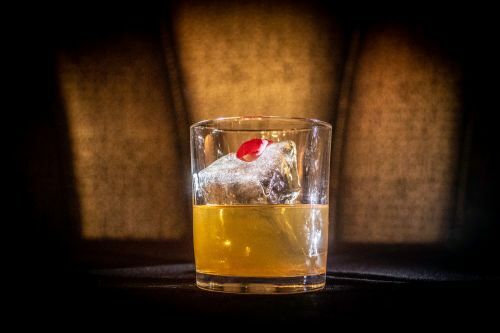 When you mention downtown fine dining and sophisticated cocktails, the conversation most certainly has to also include the HoDo Lounge, which is where we found ourselves ending this week’s mission to find the best cocktails that the local scene has to offer. Though the building and business also houses a fine dining restaurant and a boutique hotel, on this particular evening we were treated to drinks in the HoDo Lounge prepared by two different cocktail creators. Nate began by spritzing a martini glass with absinthe “to fuel the flux capacitor”, he claimed. 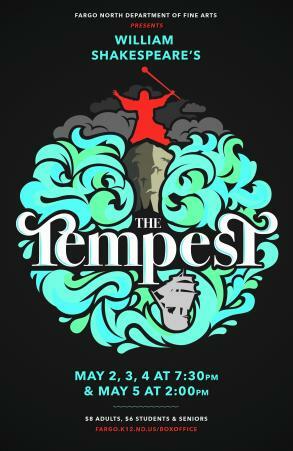 In a shaker, to that, he added Proof 2 Docks Vodka, pear vodka, elderflower liqueur, lime juice and a house-made balsamic jalapeno simple syrup before shaking with ice. This mixture was then strained into the martini glasses before a bottom float of violette liqueur was dropped into the glass. 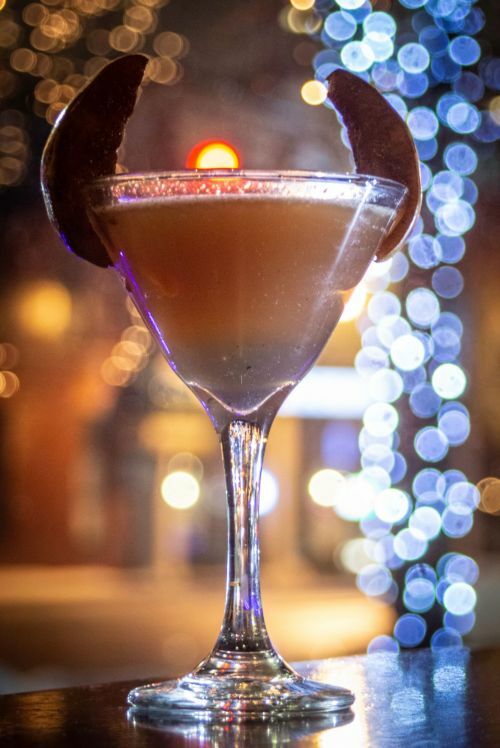 He then garnished the glass with a pair of balsamic soaked pears that were placed to look like horns before he finished the drink by adding an orange twist tossed in the middle to disturb the symmetry created by the pear horns and thus, interrupting the timeline in a paradoxical way. Pear and vinegar might not seem like the greatest of companions at first glance but the jalapeno really helped tie together the balsamic, herbaceous absinthe and elderflower all while creating a somewhat viscous mouthfeel that helps coat the palate in a strange way that allowed the heat to build but never become overpowering before the vinegar washed it away. Jared presented us with perhaps the most literal interpretation of a dessert drink, complete with two different layers of alcohol infused Italian desserts surrounding a boozy cocktail layer in the middle. The drink was presented to us in two vessels, a port wine glass and a tiny cappuccino cup. The bottom layer in the wine glass was a horchata infused panna cotta, the middle layer a brandy cocktail loaded with depth that included a charred pineapple simple syrup, Galliano liqueur, Fratello hazelnut liqueur, cognac, and a chocolate mole bitters. The top layer was a dessert topping of Cointreau infused zabaione that was made with local eggs and pinot grigio and topped with a nutmeg and cinnamon spice blend that was sprinkled on top before being slightly torched. In the tiny cappuccino cup was an espresso infused mezcal that was stirred with agave an espresso. 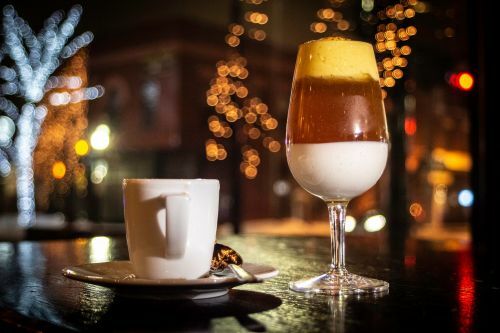 We were instructed to slightly stir the zabaione layer down into the middle cocktail layer and then, when finished with the top two layers, spoon out the panna cotta layer before finishing off the experience with the mezcal espresso chaser. While it may have seemed a bit much in regards to complexity of presentation, this drink could easily be used to either put a final punctuation mark on a full on Hotel Donaldson fine dining experience that would rival almost any other in town, or it could just as easily be used as an after dinner treat or decadent dessert drink for anyone wandering into the HoDo Lounge looking to continue or conclude a night out on the town.